This textbook introduces the reader to the new and emerging field of Conservation Psychology, which explores connections between the study of human behavior and the achievement of conservation goals. People are often cast as villains in the story of environmental degradation, seen primarily as a threat to healthy ecosystems and an obstacle to conservation. But humans are inseparable from natural ecosystems. Understanding how people think about, experience, and interact with nature is crucial for promoting environmental sustainability as well as human well-being. The book first summarizes theory and research on human cognitive, emotional, and behavioral responses to nature and goes on to review research on people's experience of nature in wild, managed, and urban settings. Finally, it examines ways to encourage conservation-oriented behavior at both individual and societal levels. 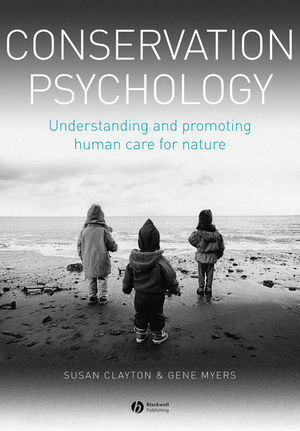 Throughout, the authors integrate a wide body of published literature to demonstrate how and why psychology is relevant to promoting a more sustainable relationship between humans and nature. Susan Clayton is a professor of social psychology at the College of Wooster. Her research aims to understand the ways in which people relate to nature, as well as to investigate broader issues of identity and justice. She is a past president of the Society for Population and Environmental Psychology. Olin Eugene (Gene) Myers Jr. is Associate Professor at Huxley College of the Environment at Western Washington University, where he offers courses in conservation psychology, human ecology, environmental ethics, and is extensively involved in undergraduate and graduate programs in environmental education. His research interests are wide-ranging and include psychology and anthrozoology as applied to conservation. 1. Introducing the Field of Conservation Psychology. The roots of conservation psychology. The potential of conservation psychology. The organization of the book. Part I: Thinking about Nature. 2. Attitudes, Values, and Perceptions. 3. Moral Psychology and the Environment. A Virtue Ethics of the Environment. The Deontic Tradition and Psychological Research. Contextual Differences in Moral Duties. Psychological Dynamics of Moral Functioning. Developing an Affiliation with Nature. 5. Theoretical Foundations for the Human Response to Nature. The Heritage of Environmental Psychology. Evolutionary Psychology and Biological Thinking. Part II: Interactions with Nature. 6. Domestic nature: Cohabiting with Animals and Plants. Plants in the Domestic Sphere. 7. Managed Nature: Zoos, Aquariums, and Public Parks. Urban Parks and Green Spaces. 8. Wild Nature: Encounters with Wilderness. Defining Wilderness and Wild Nature. Wilderness Use and Wilderness Values. The Edge of Control: Wilderness Remoteness and Challenge. Activity in Wild Nature, Connection, and Caring. Wild Nature and Spiritual Experience. Changing the Ideology of Consumerism. 10. Community Psychology and International Biodiversity Conservation. Common Pool Resources and Models of Governance. Psychology, Culture, and Local Knowledge. Accounting for the Costs and Benefits of Conservation. The Need for Environmental Education. Examples of Contemporary Environmental Education. Psychological Foundations of Environmental Education. 12. The Psychology of Hope. Human Response to Threatening Circumstances. An Alternative to a Focus on Outcomes: Creating Meaning. "Clayton and Myres have written a timely book. It heralds a new area within psychology. I highly recommend their book to psychologists of all creeds as well as to conservation biologists."